Criminals intentionally target premises that they view as soft targets. The installation of DNA Guardian has proven to be a persuasive security measure in deterring criminals from even targeting your premises in the first place. When augmented by your existing security measures, DNA Guardian will provide an effective disincentive for a robbery to occur, providing you with an investment in confidence that your premises will not be a target. When a criminal attempts to fleea crime scene, DNA Guardian sprays the criminal and any goods in their possession with a unique forensic DNA marker spray that is unique to your premises. The unit has a repetitive spraying capacity which is activated by motion detecting sensors so that multiple criminals can be sprayed on any single robbery. This spray irrefutably links the criminal directly to the crime and places them at the scene when the crime was being committed. When your alarm system is triggered the DNA Guardian unit is armed and waiting for the offender to enter into the zone that is protected by the spray (usually over egress points, but it can also be installed in any other locations that you select).The alarm system can be triggered by either a remote panic button or added on to your existing security system and when this is triggered your DNA Guardian system is activated. DNA marker spray is invisible, odourless and virtually impossible to wash from skin or clothes for up to six weeks after the crime was committed. The sole way that it can be revealed is under ultraviolet light detection technologies as used by the Police. 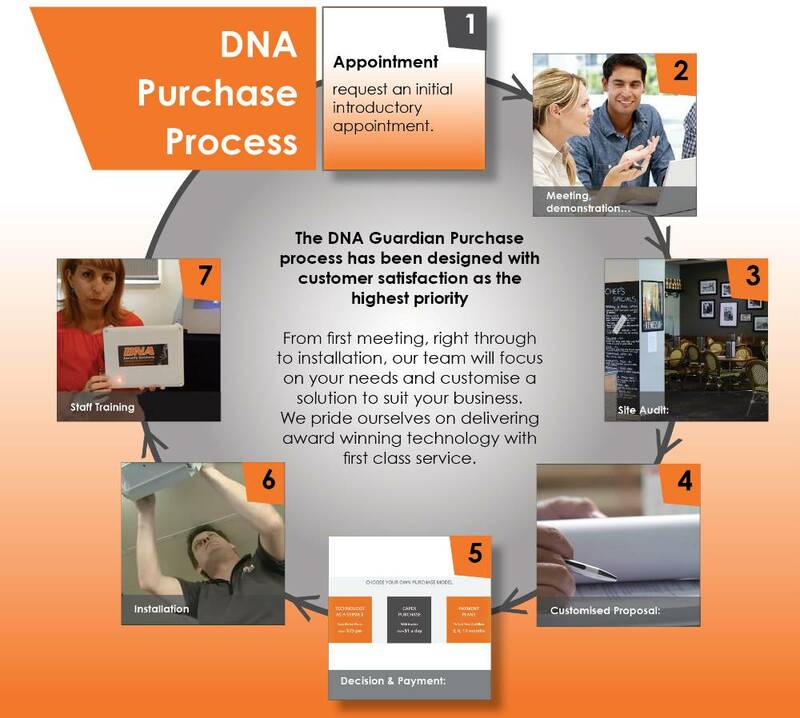 Once you have made the decision that DNA Guardian is an essential addition to your security offering, we will do the rest. We personally assist employers and individuals to assess their security risks and review current security strategies in managing these risks. Our team will recommend systems that will dovetail into and most effectively augment your current security systems. Once we have agreed on the customised approach to your business, the next step is to make a date for the installation. On the day of installation, it normally takes between 1-4 hrs depending on the size of your business. A small bottle shop/retail store, pharmacy or Jewellery store is likely to take around 1 hr. Larger Clubs and pubs will take longer if more units are needed. We will manage and co-ordinate other contractors that may be needed on your behalf – we want to make this as easy as possible for you. Once the install is done, we will conduct the easy and quick staff training session(s). This is pre-arranged to suit your business and any shift changes you may have. This normally takes around 20 mins to complete. Once training is done, you are ready to go … and we look forward to you becoming one of the 99% of customers that will never have to use it!